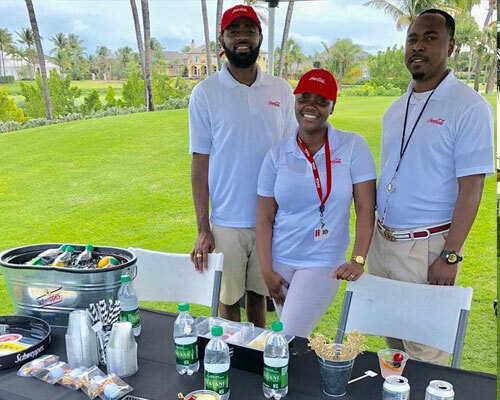 Female Golfers from around the world competed at the 2019 Bahamas White Sands LPGA Pro-Am and the Caribbean Bottling Company Ltd. (CBC) was proud to be on board as a sponsor and non-alcoholic beverage provider. In addition to a $10k cash sponsorship, CBC also hydrated golfers and event attendees with Dasani water, Powerade and various Coca-Cola beverages. 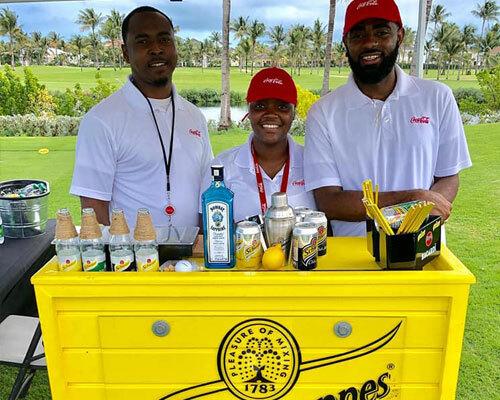 During the Feb. 2 Pro-Am competition, golfers were also be able to visit the Schweppes garden bar, where they will be able to enjoy Schweppes beverages, inclusive of Schweppes Tonic & Gin, as well as infused Dasani sparkling, complete with fresh fruit and herbs. A Coca-Cola team, which included Marvin Bethell, Lambert Knowles, Andrew Stirling, and Calvin Lockhart and professional golfer, Jillian Hollis, also took part in the tournament. The 2019 Bahamas White Sands LPGA Pro-Am was held at the Ocean Club Golf Course.